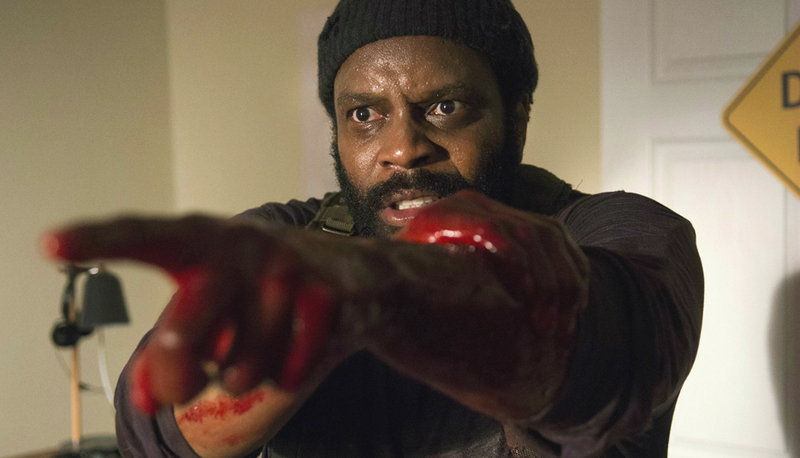 This past weekend, The Walking Dead finally came back after much anticipation. If you guys remember, the last episode was pretty gnarly, all kinds of hell broke loose in the hospital. 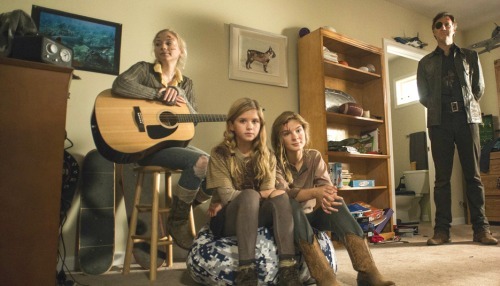 Carol was traded back to Rick’s team, Beth did something shocking and that got her killed by Dawn and Noah ended up staying with our TWD family. Now the crew is out on the road looking for a new place to find food and shelter and debating whether or not they should go to DC. 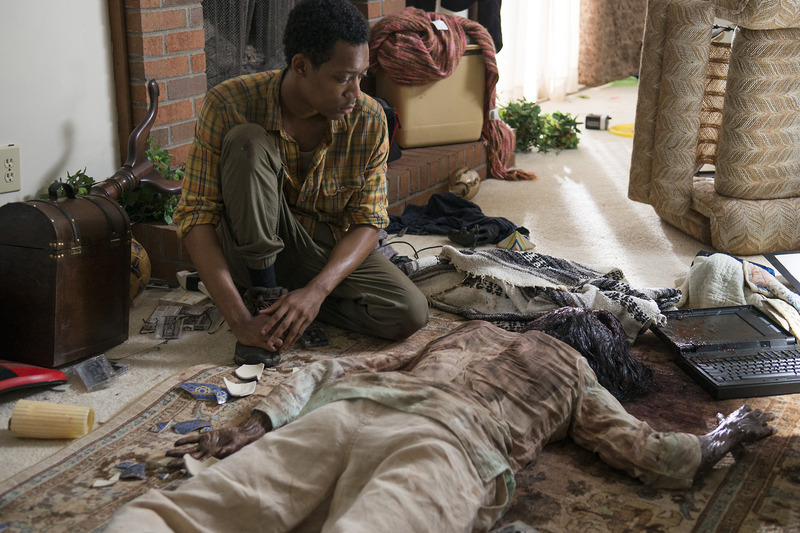 Even though they found out that Eugene was lying, they believe that may still be the place of salvation. I think at this point they need a mission, something, anything to keep them going and their spirits alive. Despite being the premiere episode, this one was quite lackluster as opposed to the usual craziness that happens. I started watching Talking Dead yesterday and I think it gave me a different perspective and made me appreciate it a bit more. This episode was somewhat poetic in a sense and gave us a different viewpoint of someone being bitten and their struggle to survive. Let’s get down to business and discuss what went down. The show opened with someone being buried and people crying. 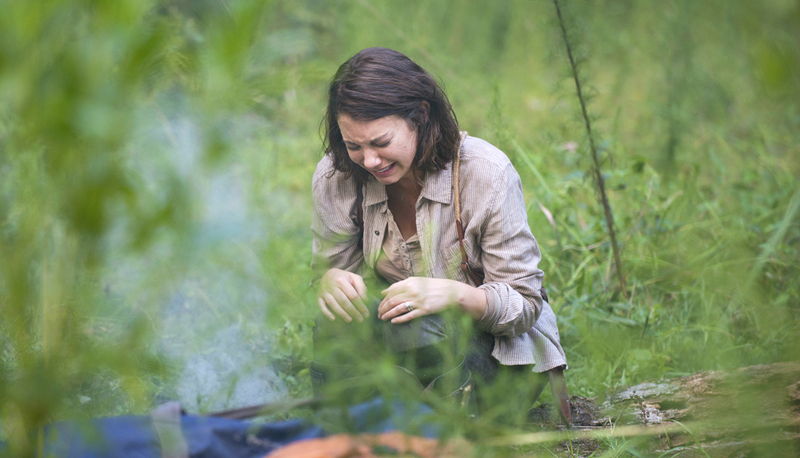 Maggie is sobbing and I thought maybe they were burying Beth, but at this point nothing is clear. Then it cut to an idyllic photo and blood dropping on it. Again, while watching this we don’t know where the episode is going at all, but we can guess that something bad is probably being foreshadowed. 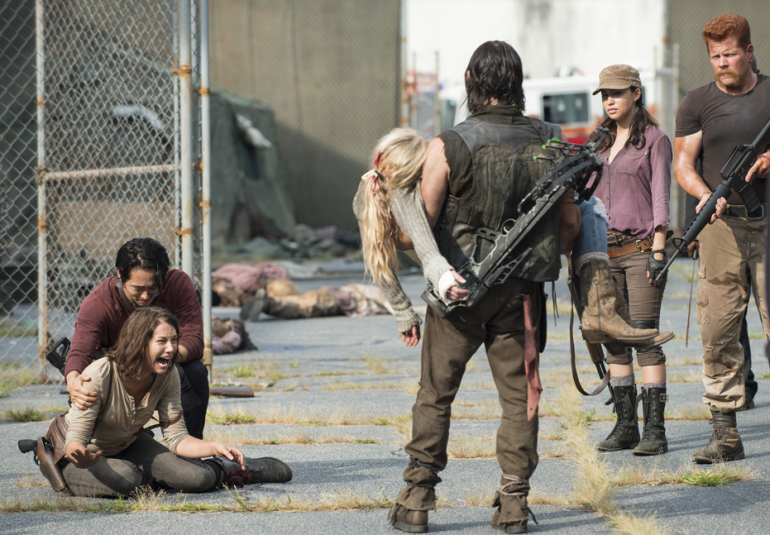 The team has split up, half are with Rick and the other crew with Carol and Daryl. They decide to go the gated community where Noah used to live, we find out that his little twin brothers and rest of his family were left there. Upon arriving, Glen looks over the gate and the whole area is in demise. 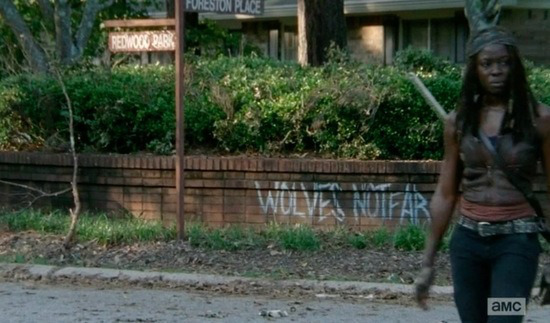 It has also been taken over by zombies and it is a desolate town filled with rotting corpses. Noah completely breaks down and everyone looks at him with blank faces, they feel his pain, but at this point it was only a matter of time for him to face this type of devastation that they have all felt at one point or another. 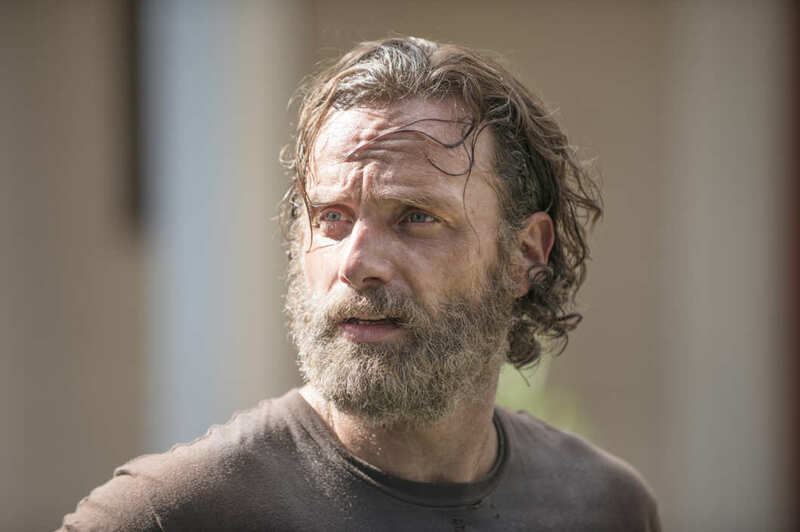 Rick says that the reason they even brought him back home was because that was originally Beth’s plan. As he says, “this was for her.” She wanted to help Noah, so they owed it to her to bring him back. Noah and Tyrese trek back to his house. We see the remnants of a life that previously was, filled with childhood toys, soccer balls and a house that pretty much looked almost intact. One of his brothers is on the floor in the living room and Noah covers him. This turns out to be a pretty sad moment for him. Tyrese goes wandering through the house to the kids’ room and he seems to be in a trance staring at pictures of the twins. Ever since Tyrese’s gf was burned to death by Carol, he has been out of it, living in his mind, thinking and brooding about the past. Then he grew close to Judith and in a sense that made him much more soft towards people, his resolve of hating others has been slowly going down the drain. Suddenly as he is staring at the pictures, the other dead brother comes right at him and takes a bite out of his arm. 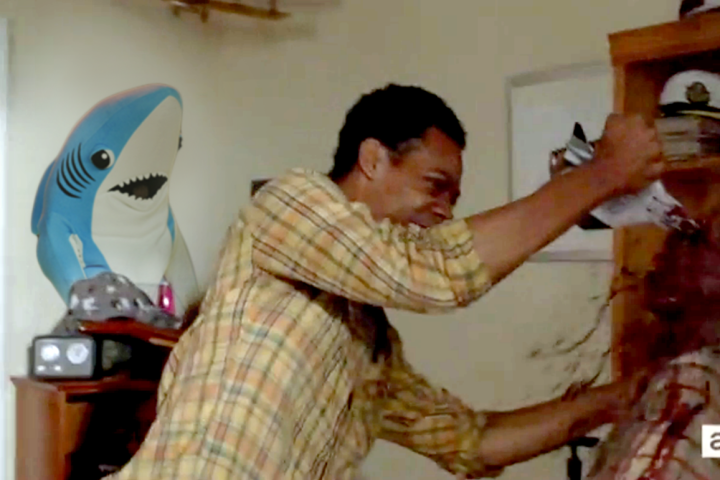 Tyrese starts screaming and Noah comes in and stabs the boy in the head with a toy airplane. He tells him he is going to go get help and leaves him alone. 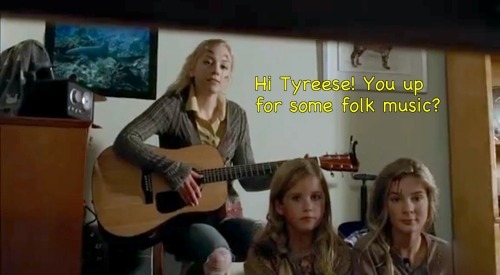 From there Tyrese goes into a psychedelic head trip and starts to see everyone that has died already like Beth, the Governor, the cannibal dude who almost killed Judith, Bob and Lizzie and her little sister, all of them telling him that it is okay to die, because it will get better. 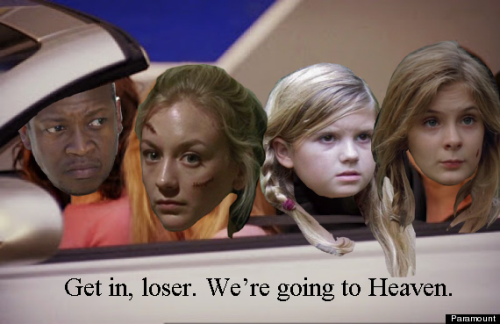 But really where was Herschel in all this? Throughout all these hallucinations he keeps getting mixed messages, the Governer tells him how could he forgive a woman that killed someone you loved, while at the same time Beth reassures him with soothing music. Then another zombie comes out of nowhere and bites him again. Oh this is not looking good for Tyrese at this point. 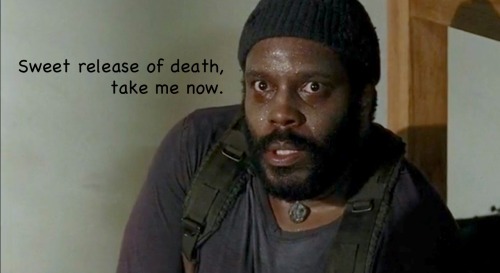 Once the team gets back, Michonne does the deed and cuts his arm off. They carry him back to the car, barely breathing with any life in his body and keep in mind Tyrese is a big boy, carrying him proved to be a difficult task for them. 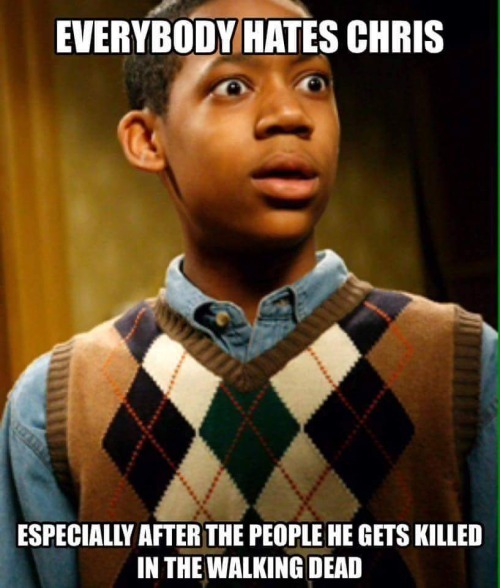 I didn’t see that coming, I wasn’t expecting him to get killed off so fast. We will miss Tyrese, he was a sweet guy and what does this tell us? That maybe the good guys, the ones with a heart never win or if you get to soft, then you become more vulnerable and easily killed? If that is the case, then who is next? What did you guys think of this episode? 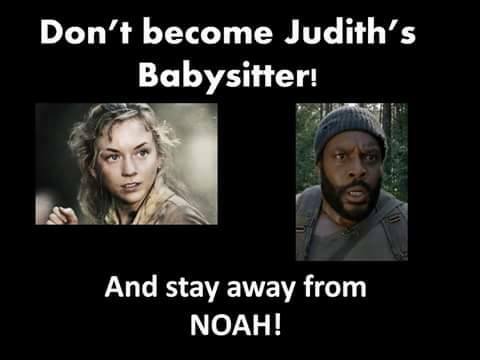 I will leave you guys with some funny TWD pics. Oh my!! A boy getting stabbed by a toy airplane??! You know this show is not for me, ahah. Oy! So. much. blood. BALLER!! I hope you’re feeling better!! Hehe. That toy airplane bit was the best part of this episode. 😉 lol – I always love your pics & gifs. 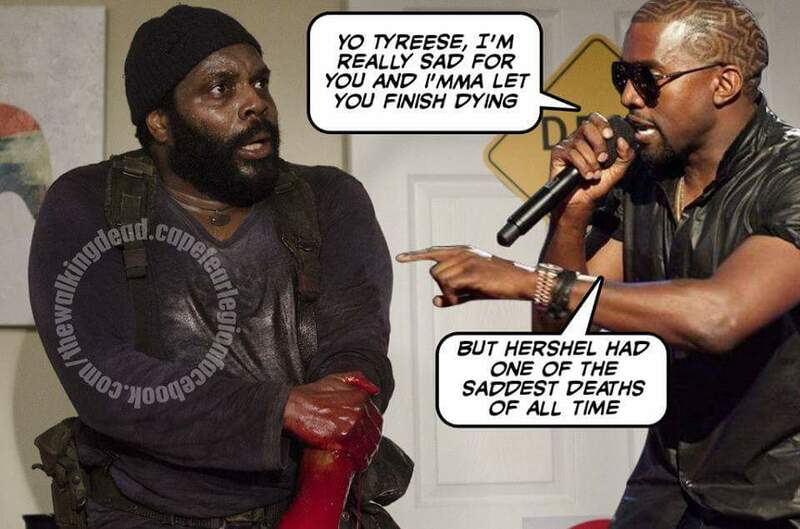 “Imma let you finish dying” hehe. Great recap again, Melissa! I enjoy our Walking Dead chats. So glad I get it only one day after you! Thanks T9M! I am literally barely coming onto my blog and online after more than a week. UGH!!! I hate being out of the loop, but I literally had no energy since I had the flu. Any who catching up today girlie! I know… It’s so hard to keep up on the blogs! Especially if you’re not feeling well. 😦 Hope you’re feeling better now!